First off let me explain the background of this section of the website relating to the USS LCI(L)538. 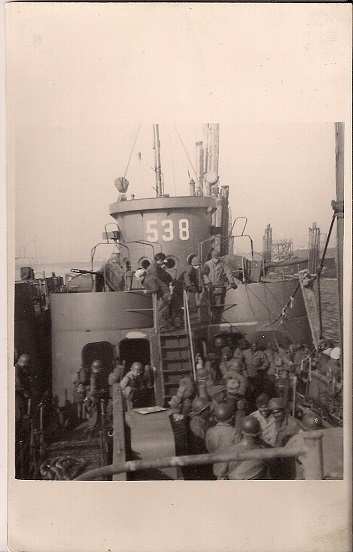 The USS LCI(L)538 was a Amphibious Naval Vessel used in World War II by the United States to land troops ashore. The ship came into being during WWII out of necessity. 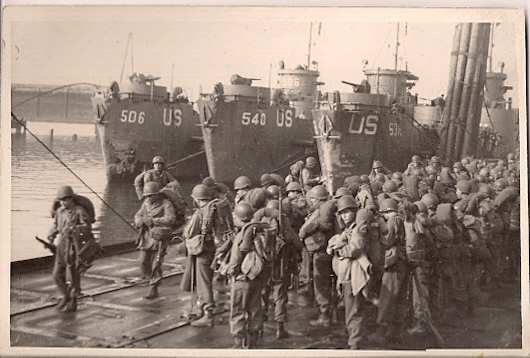 My father served aboard this ship during WWII and during the invasion of Normandy France on D Day June 6, 1944. The ship landed at the area of the beach designated Easy Red, and is where the majority of the American Soldier casualties occurred during the invasion against forces from Nazi Germany. My father passed away in 1992 and all I had was some military paperwork with very little information and some black and white pictures of troops ready to board a ship, I didn't even know what the ship was, what type of ship or if it was even the ship he was assigned to. I had no idea where the ship served during the war, and no clue as to how to find out the information. I tried searches of ships with numbers similar to the ones in the pictures and all different types of ships appeared in image searches and none resembled the ones in the photographs I had. I spent quite awhile searching, found the closest thing was the LST, but these weren't the same. I found out that a man had contacted some relatives of mine in North Carolina, because the last name listed was the same as my fathers, Bottazzo. But they told him, that was their uncle and he had passed away in 1992. He was working on trying to find old shipmates and was trying to arrange a Ship Reunion of the LCI 538. I just happened to call the same cousins in NC and was trying to find out if they knew any information about my dads military history, since the one cousin was only a few years younger than my dad. That's when it all came together, they told me they didn't have any information but someone who was a shipmate of my dad had called there trying to find my dad. They still had his number, the area code was wrong, but I looked up the area code for the area of Ohio where he lives and tried the number using that area code. In 2003 I called the number and That gentleman answered the phone and we just started talking about everything. He was the first person I have ever spoken to that knew my dad during his war years. With my dad gone in 1992 and my mom also gone, this was like a new connection to my dad. He started telling me stories of England before the invasion, the actual D Day invasion at Normandy France, I told him about my dads life after the war and we really hit it off well. The shipmates name is Jack Schmidt from Ohio. As of this writing (Jan 23, 2008) he is 85 years young, as I spoke to him today and he is still sharp as a tack. His memories are very vivid, and I explained why I was doing this and he said to feel free to put all the information from all the papers he sent me, articles, papers from the Navy and our conversations. I asked him if it was alright with him if I used his name to give him credit for providing with alot of the information and he said go ahead. I told him that I wanted to list the crew members of the ship and he said he was sure they wouldn't mind. I will somewhere in this section list their names and if you see your Name or a Relatives Name on this website and would like it Removed, please Email me and the name will be removed. The reason behind wanting to list the names is, when I was searching for information I couldn't search on the ship because, I didn't know what the ships designation was, the only reason I eventually found out was the old shipmate Jack. It didn't really do me anygood doing a search for my dads name, there is virtually no information on the ship that I can find online. I feel as if maybe by doing this part of the website for the LCI 538, that it would not only bring back to light what these men did during World War II, but it is my way of honoring them. It will also provide some information for possible family members that are in the same situation I was in, not even knowing the ships information, but maybe knowing names and dates, this information could be what puts it all together for them. The next page will be some information I have regarding the very beginning of the ship, and specifications. Just click the link provided in the Table of Contents to go to the next section regarding the ship in the important links section.